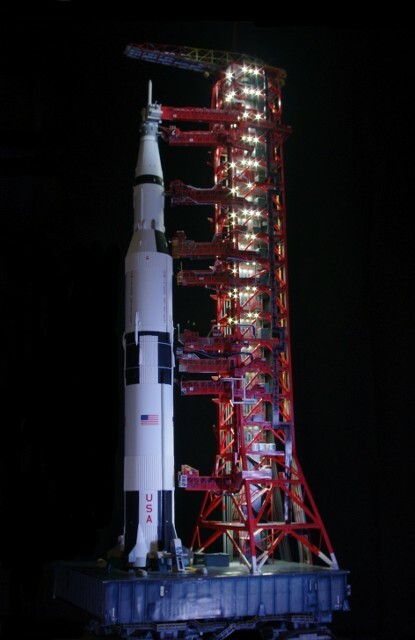 In 2009, I built the Edu-Craft Diversions’ 1/96 scale “photo-accurate” paper model of the Apollo Launch Umbilical Tower (LUT) and Mobile Launch Platform (MLP). 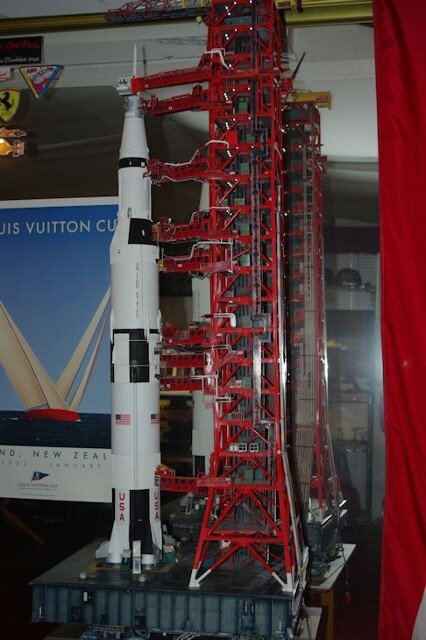 The LUT became the new display stand for my 20+ year old Revell Saturn V. It also began a long relationship withe David Maier and his impressive paper model kits. 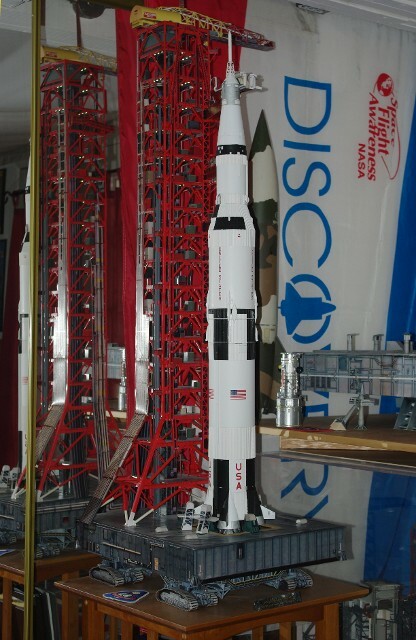 The second phase was building the Edu-Craft 1/96 scale Crawler-Transporter, to place under the LUT & Saturn V. It was an incredibly well detailed model, and a joy to look at. Phase 3 was when I found out about ParaGraphix EZ-LED products through Starship Modeler and decided to illuminate the LUT, which became a Reader’s Gallery submission to Starship Modeler in 2011. Finding available copies of these Revell kits in pristine condition is not easy, and if you do, it’s costly. So, I decided to take my old original Revell Saturn V apart, and re-do the model using the detail sets available to improve her accuracy. 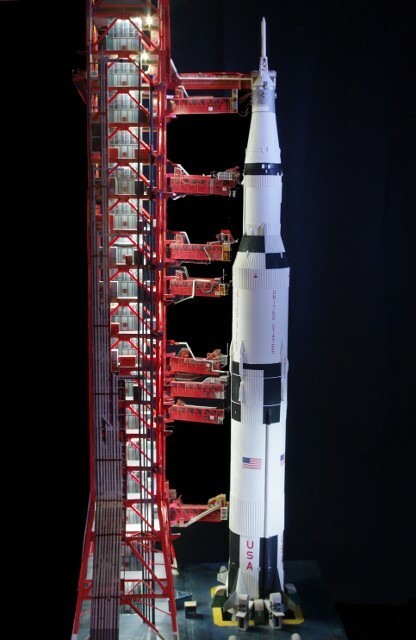 The main product employed was the New Ware 1/96 Saturn V Detail Set, which included over 200 resin and photo-etched (PE) metal parts, covering all three stages of the Saturn V, as well as parts to turn the Revell Apollo CSM from a “Block 1” version (which never flew on a Saturn V) to the Block 2 version. The New Ware set also includes an excellent decal set for the entire vehicle, with S-1C “serial numbers” for all 12 Apollo-Saturn V flights. 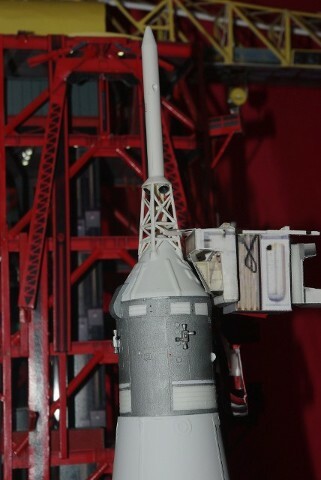 Instead of attempting to “re-do” the Revell CSM, I chose to replace it with the Real Space Models 1/96 Apollo Block 2 CSM resin kit, which also includes a vacuum-formed Boost Protective Cover (BPC), which fits over the Command Module during ascent. The Real Space kit is the only one that provides the BPC. 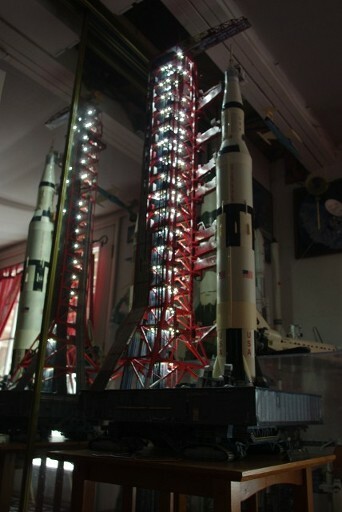 The LES, or Launch Escape System tower is taken from the Revell CSM and cemented to the Real Space BPC. 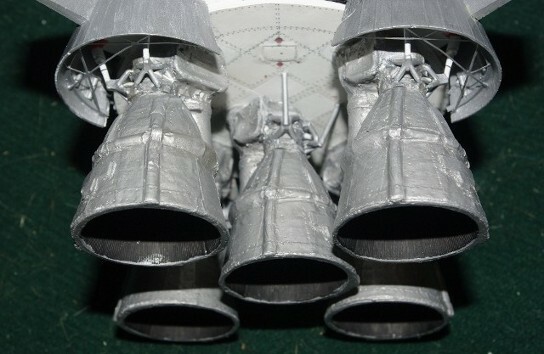 Also purchased from Real Space were the cast-resin 1/96 “Batted F-1 Engines. 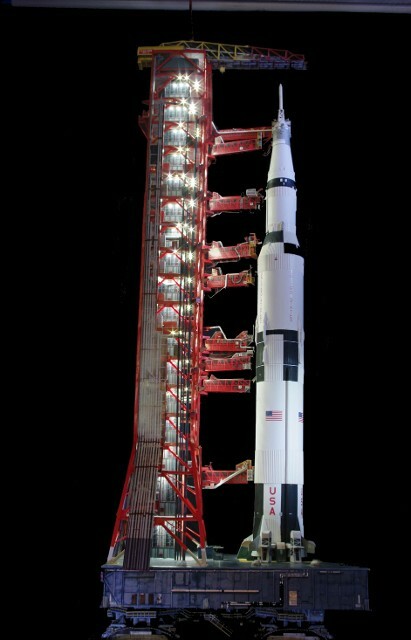 ” All of the flight article Saturn V first stages had insulating blankets wrapped around all five of the Rocketdyne F-1 engines, in order to prevent thermal interactions from affecting engine performance. Except for Real Space, no one has ever provided accurate version of the insulated, or "batted” versions of the F-1s. 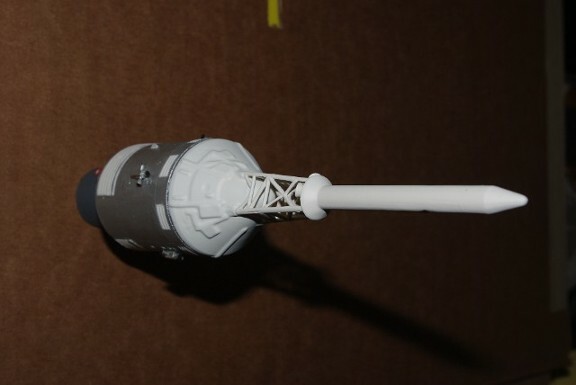 Through eBay, I also found an provider called “North American Engineering,” who sells a set of cast-resin detail parts for the S-IVB third stage. Most of this is covered better by the New Ware set, but the parts that interested me were the parts for the Instrument Unit (IU), which was the guidance and control system of the Saturn V and rode on top of the S-IVB, just under the Lunar Module attach points. As far as I know, this is the only IU “model” that’s available. Disassembling a model you’ve owned for over 20 years is almost traumatic. 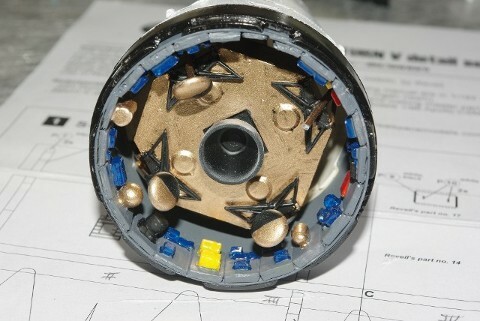 You typically only do this kind of thing if damage has occurred. But we held our breath and began the work. The results of the re-build are quite impressive to me, and I worked on the thing. The “big bird” is now back on the LUT & MLP, and looks every bit as realistic as the pad complex it rests on – which was the reason we did this. and Abel Acosta of North American Engineering. Without their work to create these incredible detail parts, this restoration job could not have been so successfully accomplished. CLICK HERE to go to the Shutterfly Share Site for the detail photos of the rennovation process. For larger photos of this build, visit the Shutterfly Share Site dedicated to this model.